ASP.NET Core is a most convenient and performant set of libraries that I find a pleasure to work with. To compliment any web framework, or any kind of project, I like to have monitoring of metrics. Using these metrics I can more easily measure usage, performance, and diagnose any problems, not to mention I just like pretty graphs confirming I'm doing something right. Today, I'm using Prometheus to measure some metrics, and I'll start with an empty .NET Core MVC project and add some metrics. I'm using .NET Core 2.1.302 to create a new MVC project named "netcore-prometheus". Restore completed in 3.12 sec for C:\Users\Daniel\Development\netcore-prometheus\netcore-prometheus.csproj. An unofficial Prometheus .NET client exists and I'm adding it to the new project's dependencies with the specialized version for .NET Core: Prometheus .NET Core Middleware package. In Startup.cs, add a using statement, and the ASP.NET Middleware. 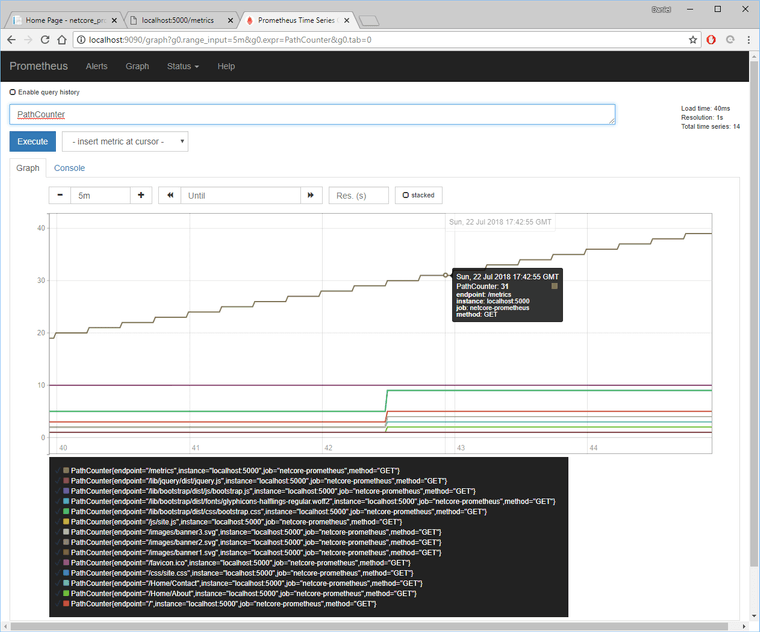 When I then run the project, I'll see that the .NET Core is exposing a new endpoint for metrics. So far, these are standard metrics exposed and no custom ones yet. I'll come back to custom metrics. 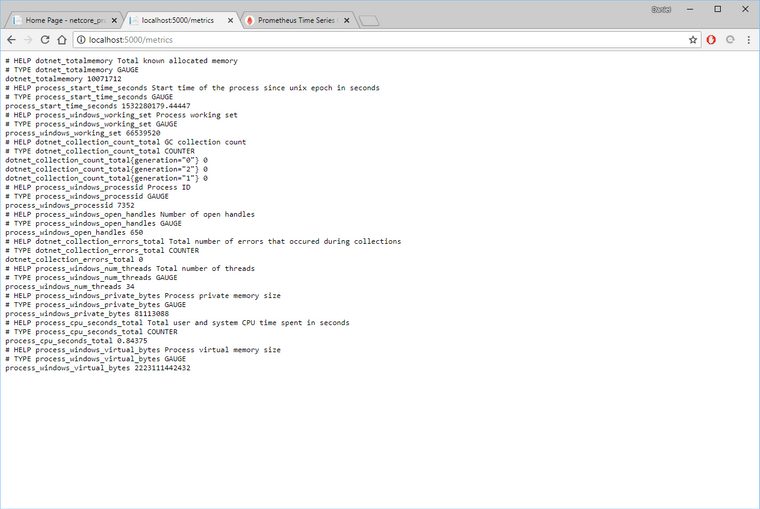 Running prometheus is simple to start. Go download and extract Prometheus to some directory. Make sure that your .NET Core MVC project is running, and then start up Prometheus. level=info ts=2018-07-22T17:13:54.5013457Z caller=main.go:222 msg="Starting Prometheus" version="(version=2.3.2, branch=HEAD, revision=71af5e29e815795e9dd14742ee7725682fa14b7b)"
level=info ts=2018-07-22T17:13:54.5013457Z caller=main.go:223 build_context="(go=go1.10.3, user=root@5258e0bd9cc1, date=20180712-14:13:08)"
level=info ts=2018-07-22T17:13:54.5023319Z caller=main.go:533 msg="Starting TSDB ..."
level=info ts=2018-07-22T17:13:54.5063459Z caller=main.go:543 msg="TSDB started"
level=info ts=2018-07-22T17:13:54.5063459Z caller=main.go:502 msg="Server is ready to receive web requests." 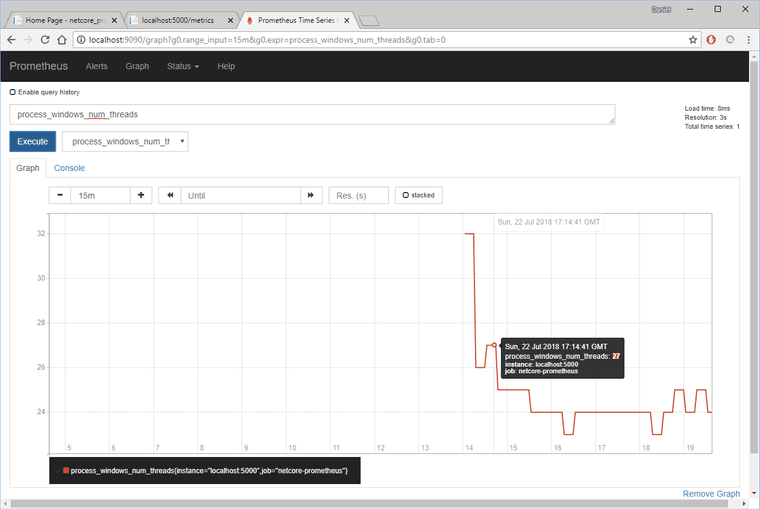 Wait a couple minutes to give Prometheus a chance to get some data, and then open up http://localhost:9090, to give a ready-to-go URL: http://localhost:9090/graph?g0.rangeinput=15m&g0.expr=processwindowsnumthreads&g0.tab=0. I now have a set of metrics that I can examine. Now let's jump in and add some custom metrics. 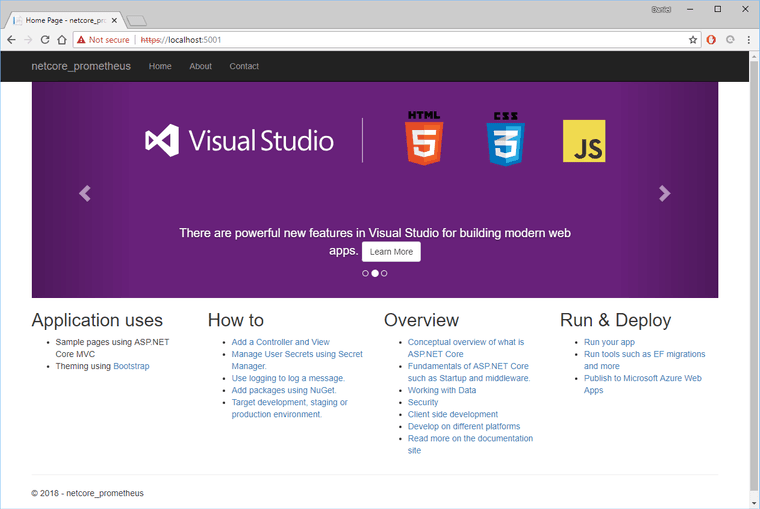 Let's start by adding an ASP.NET Core Middleware function to Startup.cs. This counts the requests for each endpoint and the method. Start the application with the new changes, click around on the page some, and then reload Prometheus http://localhost:9090/graph?g0.range_input=5m&g0.expr=PathCounter&g0.tab=0. 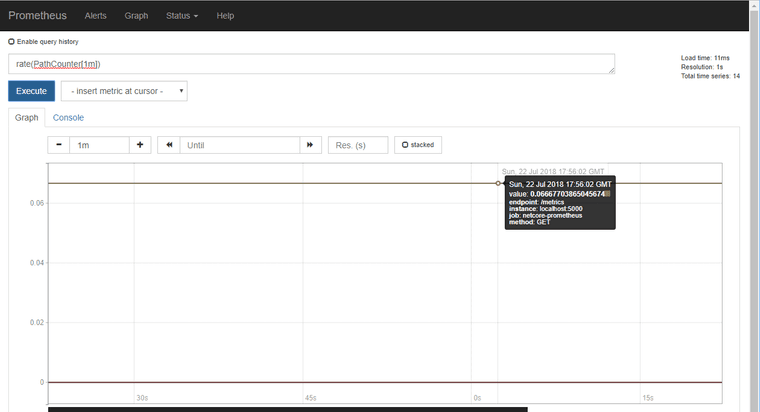 The metrics endpoint keeps incrementing because Prometheus is pulling data from it at 15 second intervals, as configured in prometheus.yml above. To get a clearer picture of how often the pages are being called, I can enter an expression such as "rate(PathCounter[1m])" to see the rate of this counter. Looking at the counter, I can see that the metrics endpoint is remaining steady at about "0.67...", which for this metric means "calls-per-second". This fits the 15 second monitoring intervals. Prometheus has four main metric types available. Knowing when to choose which is a topic of itself that completely depends upon your data and reporting needs. Just be sure to not try to force data into one type, without investigating if another type is a better fit. Monitoring is a vital piece of any software environment. Without metrics, software maintenance is just hope and faith that something improved. The next steps from here would be to add some security and to add Grafana.